The Tech Works CC-ZL-4-B is a stylish, exceptionally bright Zone Light and Programmable Controller all in one unit. 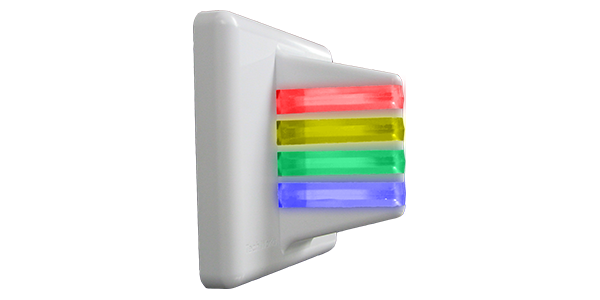 The four lights are Red, Yellow, Green, and Blue. This is an intelligent Tech Works Network device for communication with other intelligent devices on a Tech Works Network. The LED’s display the status of any Substation in groups, as assigned by the integral dip switches. The CC-ZL-4-B is field programmable for a variety of functions and options. The dip switches allow the installer to choose the group of stations or rooms to represent and the tone to sound or not sound with each group of events.